Are there any traders out there that have never cursed their chosen indicators for letting them down? Are there any traders out there that are sick and tired of hearing that past performance is no guarantee of future results? Are you ready to join the critics of technical analysis and call it a self-fulfilling prophecy? Technical Analysis (“TA”) has always had its share of detractors, but when the bank accounts of successful traders rise to the heavens, and they claim that the effective use of TA tools led to their success, then one has to wonder why the criticism persists. As the old adage goes, a poor craftsman always blames his tools for his poor results, and such is the case with the trading community. Figures may vary by medium, but veteran traders typically are only ten percent of those that started. Not everyone is cut out to be a trader. Trading requires a specific set of personality traits and analytical prowess. But, we also have heard this statement countless times, as well. In this three-part series, we will attempt to guide you around some of the very pitfalls that give TA and its associated set of indicators a bad name. Everyone knows that fundamental information is what causes market behavior to move in one direction or another, but how it moves and fluctuates to get to its next equilibrium level is what technical analysis is all about. TA is the only tool that gives us some insight into what traders are thinking and what they are “likely” to do about it. Success, however, requires a confluence of ideas. Confluence, simply stated, means a coming together. Traders, far too often, rely on a single indicator or on what they perceive as a single “silver bullet” to evaluate the potential of a set up. If this were the case, then every trading robot and system ever invented would deliver fortunes on a daily basis. No one ever said trading was easy, but your overall probability for success rises with every additional piece of evidence that supports your interpretation of the situation at hand. 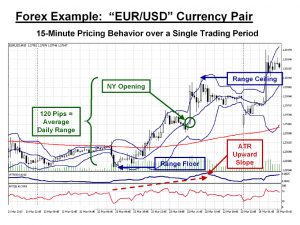 In the example above, an amateur might see that the RSI is signaling “Overbought” before the New York opening and immediately place a sell order for the Euro, only to see the market bounce back in due course. What did our beginner miss? First, only half of the Euro’s daily range had been tapped during the London session. After such a run, profit taking is the norm, the reason for the sudden dip before New York came on stream. The key point missed, however, was the positive slope of the ATR indicator, a sign that candlesticks were expanding quickly. Paul Tudor Jones was a very famous trader that used TA to amass an enormous fortune. One of his many quotes worth remembering was, “When you see a range expansion, the market is sending a very loud, clear signal that it is getting ready to move in the direction of that expansion.” The ATR signal, when combined with the market action at the time, was the evidence that there was still momentum in the recent rise. Better to go long than short, using what some have called a range expansion strategy. Successful trading is all about increasing the odds in your favor, before you ever place a position. The confluence of many reasons will help with that objective. More tips to improve your TA effectiveness will follow in subsequent articles. Stay Tuned! Complete Currency Trader is a robust trading package with full proprietary indicators, designed to get you the best entries possible and highest performance. After you purchase please send us an email to technical@indicatorforex.com with your Plimus receipt and you’ll receive the bonus. Complete Currency Trader is a groundbreaking trading software that comes with its own terminal and proprietary indicators. This system analyzes many aspects of the market in order to give you the big picture – and the most accurate signals possible. It automatically generates entry and exit signals so you are ahead of the crowd and can generate profits on any pair, on a daily basis. It also comes with a currency strength tool that meausres the relative strength of each currency – thus giving you a better look on the market than most indicators. Complete Currency Trader also automatically calculates stop loss and minimal risk, so you trade with low risk and high reward and protect your equity. This system is used and developed by real traders and it gives you a real edge in the markets. We have checked the Complete Currency Trader system and used the indicators (as well as the free ones), and they have proven themselves very effective in generating entries and exits. It is a very solid system better than most systems available today, so we can undoubtedly say that it is definitely not a scam. As always, If you don’t like the Complete Currency Trader review you can get your money back within 60 days, just send email to the tech support team (or to Clickbank directly) and your sale will be refunded. No questions asked.